Arena paintball is a popular organized recreational sport that allows you to battle your opponent with paint guns, providing a realistic gun battle between you and your adversary. 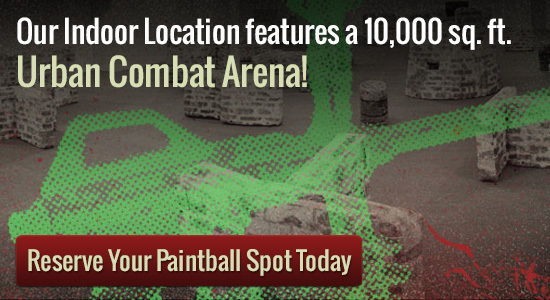 One of the best arena paintball parks in Minneapolis is Splatball, and the oldest paintball field in Minnesota. It even has a large spectator area for friends and family who just want to watch and cheer on. Splatball is an indoor location right in Downtown Minneapolis. It features a 10,000 square foot urban combat arena as well as the largest retail store/tech center in Minnesota. The entire facility is climate controlled for maximum comfort. We even have an observation area and private party room. You are bound to have a great time at Splatball, just choosing which game you want to do first will be challenge in itself. With our vast array of amenities and services you can’t go wrong. We also offer private paintball games and walk-on play for individuals or groups who have less than 8 players. Make a reservation for a party with our awesome group specials. It doesn’t matter what it’s for; birthday parties, bachelor parties, youth groups and corporate events, we are Minnesota’s paintball party experts. For you serious arena paintball players don’t forget to check out our season passes. Not only are we extremely reasonably priced but you can also use them at other facilities. Please give us a call at 612-378-0385 to reserve your spot today. We can also answer any questions you may have about Splatball and the booking process.